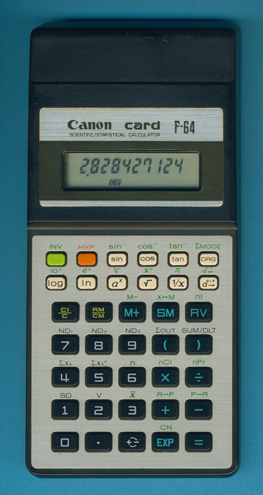 Size: 6.1" x 3.0" x 0.80"
The Canon F-64 Scientific Statistical Calculator is together with its sibling F-56 one of the few Canon products based on NEC single-chip calculator circuits. One of the odd behaviors of the NEC uPD1856G circuit is the left to right entry method. Running the Calculator Forensics on the F-56 reveals with 9.0001495952 an impressive result compared to similar calculators of the early 80's. On the other hand supports the chip no rounding of the display results. The internal construction of the F-64 is pretty simple and uses only a few components on a single-sided printed circuit board (PCB). Please notice the odd package of the NEC uPD1856G single-chip calculator circuit. © Joerg Woerner, November 26, 2014. No reprints without written permission.